Sealaska Heritage Institute (SHI) will unveil a new exhibit featuring Native masks from across the state that elucidates their ancient and current uses. The exhibit, Alaska Native Masks: Art & Ceremony, includes 50 masks from the Iñupiat, Yup’ik, Alutiiq, Athabascan, Tlingit, Haida and Tsimshian and is on display in the Nathan Jackson Gallery at the Walter Soboleff Building in Juneau. SHI will open the display to the public on Friday, Dec. 2, during Gallery Walk, said SHI President Rosita Worl, noting the exhibit is part of SHI’s advocacy to promote Alaska Native arts, cultures, history and education statewide. 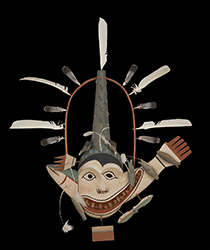 “Masks are an ancient tradition among Alaska Natives, and we want to expound on their meanings and uses for the general public. They are the medium through which humans interact and communicate with the supernatural world. Masks are used in ceremonies and in dances to evoke, appease and influence the spirits they depict,” Worl said. Masks are often used in theatrical performances or dance to tell mythological or historical legends. In some regions, masks are used to tease or ridicule fellow village members with the goal of resolving conflicts. While the basic meaning and use of masks are fairly uniform among the Native societies, their representations vary dramatically both in their realistic interpretations and surrealistic creations among the different tribal groups. In the exhibit, masks are grouped by their cultural significance rather than by geographical divisions or cultural affiliation. The exhibit also features masks that were made for sale, but these masks uniformly draw on the ancient meaning that gave rise to masks in each of these societies. The exhibit will be open to the public on Friday, Dec. 2, during Gallery Walk then close until May. SHI will grant special and school tours upon request in the interim. Gallery Walk also will include three dance performances and featured artists in the lobby of the building. Caption: “Tuunraq with Gaping Mouth” mask by the late Tlingit artist Jim Schoppert is one of 50 pieces on display at Sealaska Heritage Institute’s “Alaska Native Masks: Art & Ceremony” exhibit in Juneau.